Life isn’t about waiting for the storm to pass. It’s about learning to dance in the rain. — Vivian Greene Dance now. Dance always. Enjoy the dance. 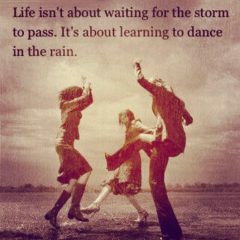 Learn to dance in the rain. Learn to dance in the sunshine.